The supercar does a mile in just 3.6 seconds. Evoking memories of Malcolm and Donald Campbell's exploits in the Bluebird CN7 is no mean feat yet an effort born on the edge of the River Avon wants in on the world land speed race. 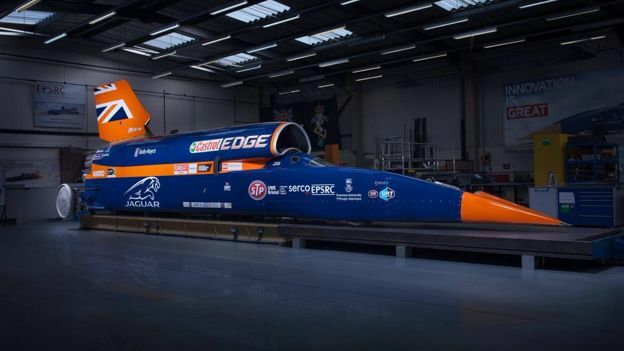 The Bloodhound SSC is the latest supersonic vehicle to take on the challenge of breaking the record and the £10 million rocket propelled car gets its debut this week at Canary Wharf before it attempts to hit speeds in excess of 1,000mph next year. Eight years in the making, the multi-million pound Bloodhound was assembled at Avonmouth on the outskirts of Bristol and a total of 350 companies and universities have worked on the research, design and production that goes into the vehicle. When it comes to speed, the Bloodhound SSC can do a mile in just 3.6 seconds and that's likely to be enough for it to surpass the current land speed record of 763mph set by the Thrust SSC at Black Rock Desert, Nevada in 1997. At the wheel for that effort was Andy Green and he will also be piloting the Bloodhound, which he describes as "an extraordinary piece of extreme technology”. All that speed requires a great deal of power and in this regard there are three sources - a Rolls Royce EJ200 jet straight out of a Eurofighter Typhoon, a collection of Nammo hybrid rockets and a Jaguar V8. When combined they produce 135,000 thrust horsepower, which is the same as 180 Formula One cars. Anyone interested in getting a peek at the Bloodhound SSC needs to get a free ticket from the supercar's website that will be timed for this Friday (25th) or Saturday (26th). After that it's on to the runway tests at the Newquay Aerohub at Easter before it eventually hits the track in the South African desert in 2016.